For decades, the Ordo Veritatis has fought the occult operations of the Esoterrorists, occult operatives bent on ripping apart the membrane between our reality and the demonic vortex of the Outer Dark. Now that threat directly looms. A barbaric ritual in an underground club touches off a series of coordinated assaults designed to break our world forever. In this world spanning campaign of interlocking scenarios, your agents conduct the high-stakes investigations required to stop them. Until now, Esoterror's cosmic endgame has been described in background material but never taken centre stage in adventures your agents can take part in. They've read the training manuals. They've attended the briefings. Now it's time to deploy their knowledge in the field, staking life, limb and mental stability against those who would destroy everything we know. 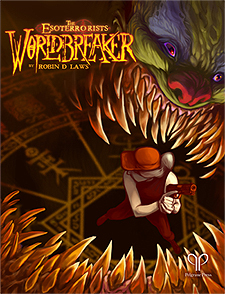 After a gore spattered prologue, Worldbreaker gives your players the choice of four harrowing scenarios they can tackle in any order. From caverns deep below Belize to an arm's dealers warehouse in Transnistra, from Silicon Valley offices to haunted, rebel-held forests of Nigeria, your agents unravel the schemes of monsters both metaphorical and literal. Battle deconstructed animals, opportunistic demons, body-stealing parasites and otherworldly PR agents. Put together the pieces leading to the climactic intervention against the conspiracy's mastermind and the mightiest most destructive Outer Dark Entity to ever squeeze through a hold between realms. All adventures written by Robin D Laws, creator of GUMSHOE and the Esoterror setting. Can You Keep The World Unbroken? And How Many Agents Will You Lose Along The Way?